Tiffany is headed to California to live with the father she has never met nor even knew existed until shortly before her mother died. As if that weren't enough of a change, when she arrives she finds out that she has four half sisters and a white stepmother. 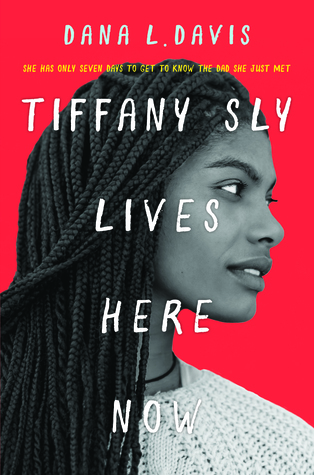 Tiffany's new family has some strict rules governing her behavior, starting with her father's belief that his girls should not wear any weaves or braids, only their natural hair. That will be a problem for Tiffany since she has alopecia - hair loss - thanks to the stress of watching her mother die of cancer. Luckily, she gets some help from the woman across the street who is also a hairdresser as well as the mother of the weird kid who wears white make up all the time. Tiffany's life has changed dramatically in all kinds of ways, but there could still be one more shock - this might not be her family at all! Shortly before she left Chicago another man showed up on her doorstep claiming to be her father as well and asking for a DNA test. Time is running out and no one knows the secret. I just thoroughly enjoyed this book despite a few flaws. Tiffany is so secure in who she is (despite her crippling anxiety) that I loved watching her interactions with everyone around her. She is a good girl but she's not afraid to stand up to the jerk at school and her dad who is also a jerk for a good portion of the book with his crazy, controlling rules. But she's working hard to fit in with her new family and supportive of her stepmother as she also tries to deal with her controlled life. I really liked Tiffany's representation as an atheist which is something I don't remember seeing in most/any other YA books I've read. And although that is contrasted with the Jehovah's Witness religion of her family, I didn't feel like their religion was being criticized or shown to be bad in any way. Given how strict he is for most of the book, his transformation to trying to be a decent guy is pretty quick. Particularly his reaction to Tiffany's sister and her situation. The depiction of the youngest sister who is autistic bothered me in that the family seemed pretty clueless on how to deal with her. Of course Dad doesn't because that's his character, but even Tiffany's stepmom apparently hasn't done some basic research on how to handle an autistic toddler. There are A LOT of story threads and several of them are left somewhat open. I ruminated on these problems and a few others and felt like maybe I should like the book less or take away a star in my rating but I still just liked the whole thing. So I ignored that feeling! I think it's a great title to sell to my 8th graders in particular who will appreciate the great heroine, the drama of the story, the "villain", and a book with a black character who does not live in the ghetto.